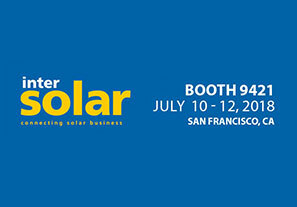 NEW YORK, NEW YORK – July 5, 2018 – GameChange Solar today announced that it will unveil details of how the Genius Tracker™ single axis solar tracker system allows for up to 6.75% higher energy production than typical competitor trackers at Intersolar 2018. GameChange Solar will also introduce several other innovations in both fixed tilt and trackers that improve value for customers. With over 3.2GW sold, GameChange systems combine fast install, bankable quality and unbeatable value through superior engineering, innovative design and high volume manufacturing. GameChange Solar is driven by its mission to repower the planet with clean solar energy. We do our part by driving fixed tilt racking and tracker equipment costs lower.